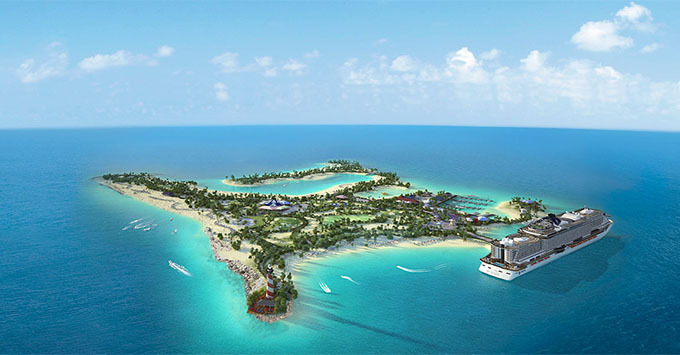 (5 p.m. EST) -- MSC Cruises broke ground for its newest private island, Ocean Cay, on January 15. Located just south of the Bahamas, Ocean Cay will be a port stop that's exclusive for MSC passengers. The 95-acre island will function as a marine reserve, where cruisers can enjoy six beaches, several restaurants and bars, and the first-ever private island amphitheater, which will seat 2,000 people. Ships will dock at a purpose-built berth, which means passengers won't have to tender, and MSC says it plans to switch up the experience by docking at Ocean Cay until midnight, allowing cruisers to enjoy the island into the night if they prefer. Additionally, passengers booked in MSC's exclusive Yacht Club will see their perks extended ashore with butler service, an exclusive spa and a wellness sanctuary with private bungalows and massage huts. The island, which MSC has leased from the Bahamian government for 100 years, is slated to open to visitors in November 2018.